Hola! My name is Amanda, and I have an exciting, unique idea for a new business that I'd like to share with you, and hope you can support it's creation! 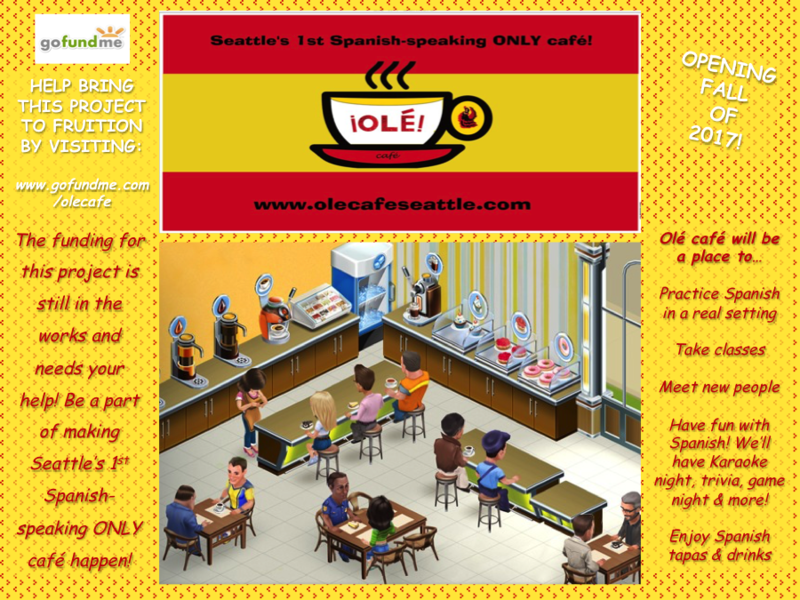 Seattle has an abundance of coffee shops, but none will be like ¡Olé! Café...Imagine walking into a café in the heart of Madrid during a trip to Spain; you order a café con leche and pan tostado, have a seat next to another patron and strike up a conversation in Spanish, while hearing Manú Chao playing in the background. You think: I wish I could have a place like this to meet others and practice Spanish when I get back home. Now you will, but it will be so much more. Before entering Olé Café, you'll notice a sign that says "Spanish only". You'll be greeted in Spanish by your barista and excited by the array of Spanish tapas and beverages in front of you: tortilla española, croquetas, pan tostado con tomate y jamón serrano...you'll sit down with your café and comida and perhaps dust off your Spanish with the person next to you (don't worry, there will be some handy "phrases" on a sign at your table). You'll see books and games in Spanish, a separate classroom area, hear authentic tunes en español, check out the events calendar listing nightly happenings such as karaoke or game night and see course offerings and guided trip opportunities by Vámonos Spanish Center (my already established business that has been running for 2 years, www.vamonosspanish.com). By the time you leave, you'll likely have gotten in speaking practice, made a new friend, had Spanish food, listened to a Spanish artist that you now love, signed up for a group class, and made plans to meet your new friend at the trivia night in Spanish on Friday. Olé will be a community to meet others (something that Seattle is desperately lacking) and to practice language in real-life situations that usually can only be done through travel. There will be an abundance of services offered including: group classes, tutoring and foreign travel; there will also be game nights, karaoke, trivia, live music, wine/coffee conversation hours, and much, much more. You'll learn about Spanish culture, and Latin America too, as we will occasionally celebrate holidays from other Spanish-Speaking countries. I began working as a Spanish middle school teacher and quickly learned that the job was not conducive to how I envisioned teaching others, nor how I planned to spend my life. A language class needs to be fun, interactive and exciting, but this was hard to create with large classes and limiting district policies. After 2 years of working 7-5, being under-appreciated, and feeling like I wasn't making a difference, I changed gears. I started a small Spanish-language school, Vámonos Spanish Center, and began teaching group classes just as I had envisioned they should be taught. As the school grew, so did my vision for Olé Café. After 2 years of business I am excited to now be expanding the idea of creating a Spanish-speaking community in Wallingford/Seattle and to be sharing this dream with you. I can't wait to make it a reality! I am so passionate about the Spanish language and hope to inspire and show as many people as I can the great benefits of learning another language, especially Spanish. Thank you to those who have already donated to this project and want to see it come to fruition. I am truly grateful that you are inspired and excited by this idea! I am currently working on a business plan, and once completed will begin the process of applying for a business loan. I plan to put forth 1/3 of the initial investment from my personal finances, request a loan for 1/3, and hope that this campaign will help me with the last 1/3 of my needed startup budget. Once I am able to reach my target budget of 45K (ideally by the Summer of 2017), I will begin by finding the perfect location, in or near Wallingford, Seattle. Then I will get into action to furnish the café, hire a few staff members and put all the pieces together. I plan to put whatever amount is raised on this site in conjunction with other funds towards the creation of this project. The projected budget factors in equipment, furnishings, potential construction needed, marketing, staffing, signage, promotional products, licensing and the first few months of rent and utilities for the space. We truly are living the American dream; to have an idea and be able to make it happen through the help of others is something very special and unique to this country that I am grateful for everyday. I feel lucky to have the chance to raise money and make this vision a reality, for myself, my students and community. To all of my donors, I am SO thankful for your donation and can't wait to see you at Olé Café! 5/22 Hola! I am a couple weeks away from finishing my business plan (hooray) at which point I will submit it to the Women's Business Center for a small business loan. I have been doing a lot of research on all aspects of the business, and am getting very excited! I have found 2 potential spaces in Wallingford, and am pursuing both of them. I am also collecting early registrations for Fall quarter so that I have the needed capital to rent a space if it is the right one, and will also use the funds collected from gofundme (they also helped me take a business class in February!). SEPT 2017: Open for business! Thanks for your continued support and positive feedback, I'm excited to get this project into motion! Hola! I am currently working on a business plan so that I can explore other funding avenues.. Stay tuned! Meanwhile, I've created a visual to capture what I hope the café will be..a meeting spot for old friends and new to practice Spanish! Can you visualize Olé Café? 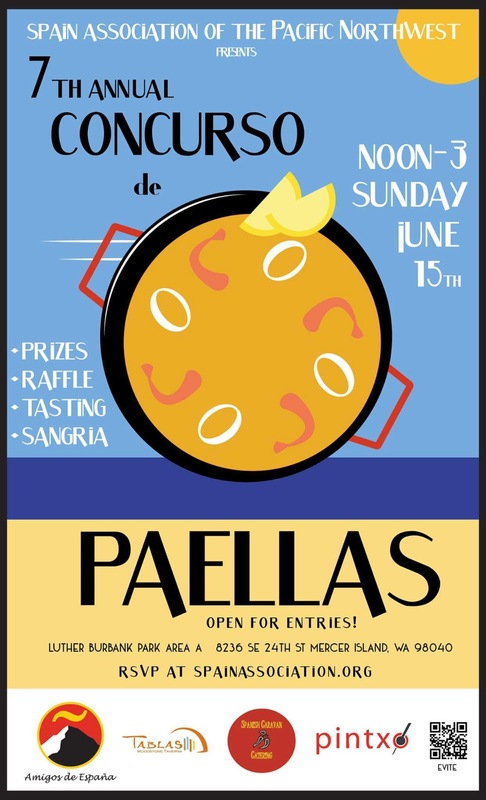 Yesterday I went to the 7th annual paella competition in Seattle to spread the word about Olé café to Spaniards and to some of their English-speaking counterparts... there was excitement and interest from all! Attend an exclusive "silver donor only" coffee tasting before the café is officially open! You'll also get an O.C. sticker. Look for an evite via email. Receive a coffee punch card for 5 beverages of your choice! Please redeem card in the café by saying you are a "bronze donor." Receive an exclusive Olé café t-shirt. Please redeem at the café by saying you are a "gold" member. Receive a 1-1 private Spanish lesson with Amanda! Enjoy coffee on us during your class. You'll also get an Olé café button. Your name will be permanently displayed in Olé café as a VIP donor! You'll also be invited to an exclusive event to reveal the contributor wall. Receive the VIP donor reward plus an exclusive Olé café button! Receive the VIP donor reward plus an exclusive Olé café t-shirt! You'll receive the VIP donor + + award as well as an invitation to an exclusive grand opening party before the revealing to the public! Receive the VIP student reward (name on donor wall, a t-shirt, exclusive party invite) + a coffee punchcard for 5 beverages at Olé café. Receive the VIP student + award & free registration off any tour offered by Vámonos Spanish Center. Trips to Spain, Mexico, Cuba and more will be offered! Receive 10% off all products and services (except trips) offered through Olé Café and Vámonos Spanish Center for 1 year! + VIP traveller! Free classes for one year! As well, receive 25% off all products and services offered through Olé Café and Vámonos Spanish Center for 1 year! + VIP traveler! I think this is a unique and novel idea, and one that would be a great addition to Seattle!